Wherever you look you can be sure to find symbolism in something. Every animal, plant, and even inanimate things and ideas can have their own symbolism to them. Groups of things can share symbolism, while individuals within a group can have their own unique symbolism. 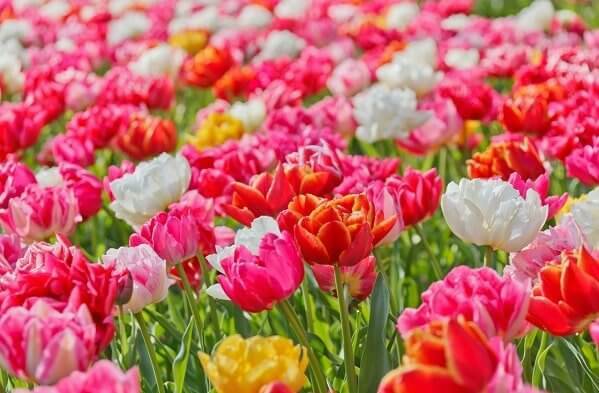 This article will show this by discussing the general symbolism of flowers, as well as talking about the symbolism behind specific types of flowers: the pansy, rose, and tulip. Flowers can be found on every continent except for Antarctica. So it’s no wonder that nearly every culture has their own way to describe the meaning and symbolism of flowers. Flowers have been used for centuries to decorate or be given to loved ones to show affection. This is one of the simple reasons why flowers symbolize beauty and love. Flowers can also symbolize growth and renewal. Some types of flowers grow anew when the right season comes without needing to be replanted. In a way, this symbolizes the circle of life. In the spring, flowers pop out of the ground. They hang around until the end of fall and seem to die when winter comes. However, these same types of flowers just pop back up when the spring rolls around again. There are many other things that can symbolize the flower depending on which culture is describing them, but these are some of the universal flower meanings. Roses are often given to show romantic love. This emphasizes their symbolism for beauty and love. While passion is an obvious meaning to the rose, there are some not so obvious meanings behind this flower as well. A few of these hidden meanings are intelligence, courage, and honor. People rarely use these meanings for the rose though. It is usually only used for it’s romantic meanings. Deep love, commitment, and communication are the most popular meanings for this pretty flower. All flowers share the symbols for growth and beauty, but they also have unique additional symbolism. The pansy is often used in times of memorial. It’s not strange to see them left as gifts in cemeteries. Because of this, the pansy is often said to symbolize remembrance and togetherness. When someone dies, their friends and family usually do their best to comfort each other; this fact helps to further emphasize the meaning of unity and memory in the pansy flower. Lastly, the tulip has some special symbolism of its own as well. In case you didn’t already know, flowers move slowly during the day. They obviosuly don’t walk like people, but they do turn to face the sun. Their petals open and close during the day, usually depending on the direction of the sun. Tulips follow the sun with their heads, like sunflowers. This symbolizes oppertunity. If you see the sun, aim for it. It also symbolizes a certain amount of awareness. Even though flowers cannot think like people do, they still do what they can to get the most out of the day. In a way, we can learn from the actions of the tulip flower symbol. These flowers also grow in the spring without the need to plant new bulbs. This helps to symbolize the circle of life and death. These are just a few of the symbolic flowers. Every flower has their own unique symbolism. If you want to learn more about flower symbolism, or any other kind of symbolism, then you can read more articles like this one here on Sunsigns.Org! Previous Who Is Your Psychic Twin?